Today marks five weeks of peace. 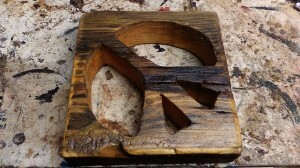 Number 35 is made from a 1 1/2″ piece of pine. It’s just a little off. A change in perspective can turn confrontation into reconciliation. It can lead to understanding and peace. Absence of violence doesn’t necessarily create peace. But peace disavows violence. The source of your suffering can be the source of your strength. Small ripples make waves. 35 down 330 to go.